Find comfort and convenience in a modern hub, only steps away from the terminal. Sofitel Athens Airport welcomes you to the Greek capital. In an environment harmoniously combining heartfelt hospitality, modern surroundings and impeccable organisation, you will find the ideal solution for luxurious accommodation and business meetings. Enjoy a magnifique experience at Karavi restaurant with our global cuisine and panoramic views or at the modern restaurant Mesoghaia serving Greek cuisine, available 24h/24. Artemis bar is the perfect place to share a drink or even enjoy a light snack. 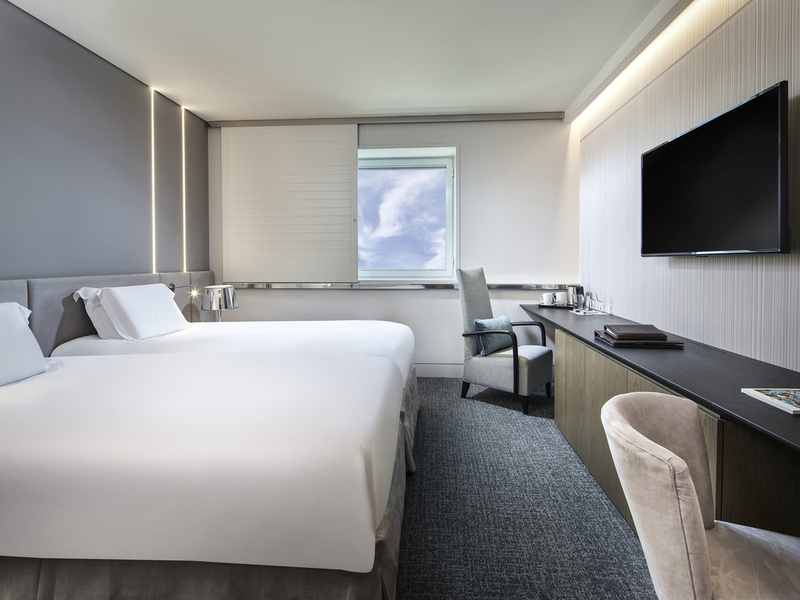 The only hotel at Athens airport, Sofitel Athens Airport extends a distinctive combination of French refinement and Greek hospitality to all business and leisure guests, whether you're passing by or staying in Athens for a few hours, a few days, or more. Please join us for a Magnifique voyage to a hotel where modern and classical Greek influences meet French art de recevoir. You're just 35 minutes from central Athens by metro, a hop from Piraeus and the Greek islands. 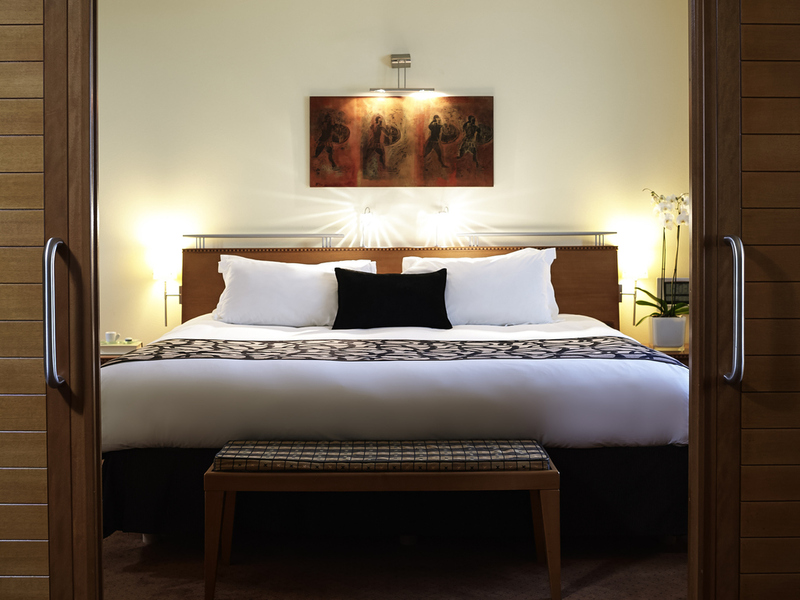 Life is Magnifique in Athens..
Each Sofitel hotel is a unique blend of the French art de vivre and local refinement. 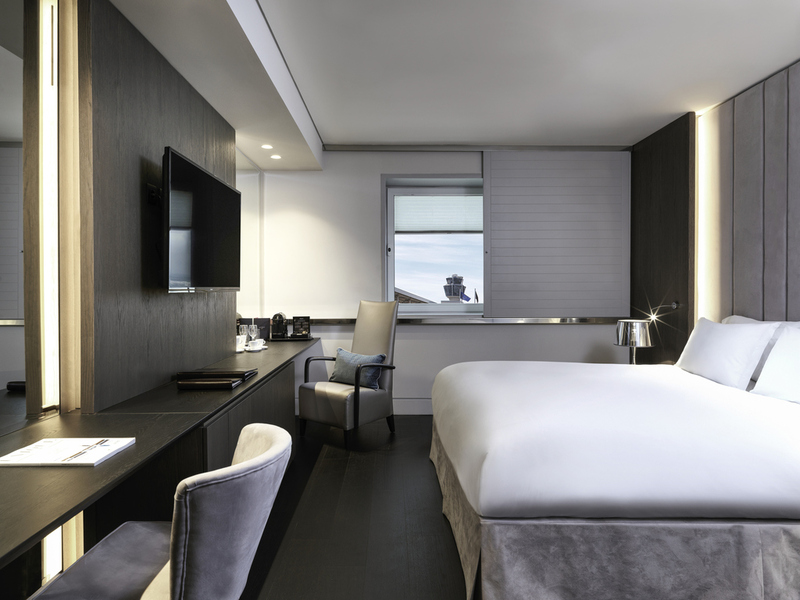 At Sofitel Athens Airport, gateway to centuries of Greek history and idyllic islands, modern architecture blends with classical influences in a 3,000-year-old city. 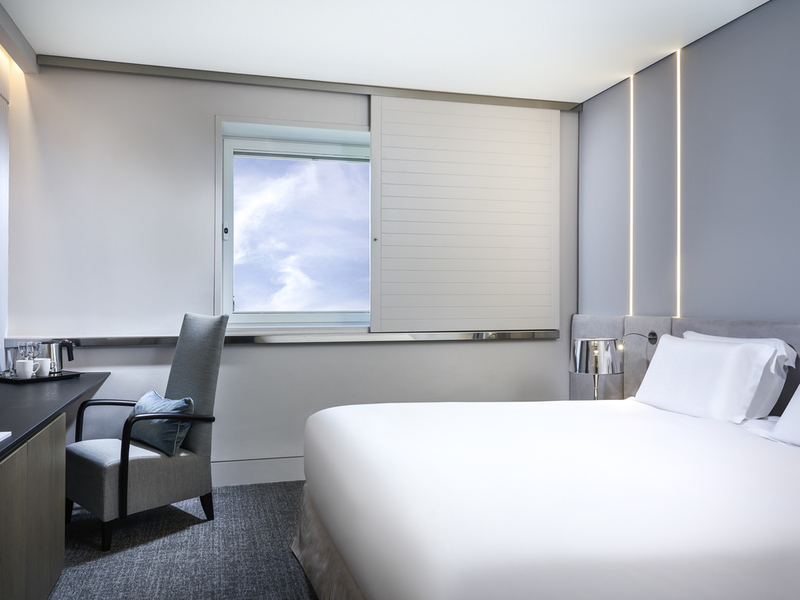 With an enviable location just 50 meters from the airport terminal, the hotel entices you into a chic yet comfortable environment with a futuristic French feel. Relax in a blissful retreat before continuing your exploration of Athens' ancient treasures. Glide effortlessly into the cradle of Western civilization in minutes, by the Attiki Odos freeway, subway, rail or bus. The business district of Marousi, main center, shopping area, Olympic Stadium and millennial monuments are all a seamless ride away. In Athens you can find the magnificence of ancient times, and the finest contemporary pleasures. Visit the Acropolis, the Parthenon, the Panathenaic Stadium, the ancient temple of Poseidon in Sounio and the picturesque port of Lavrio. 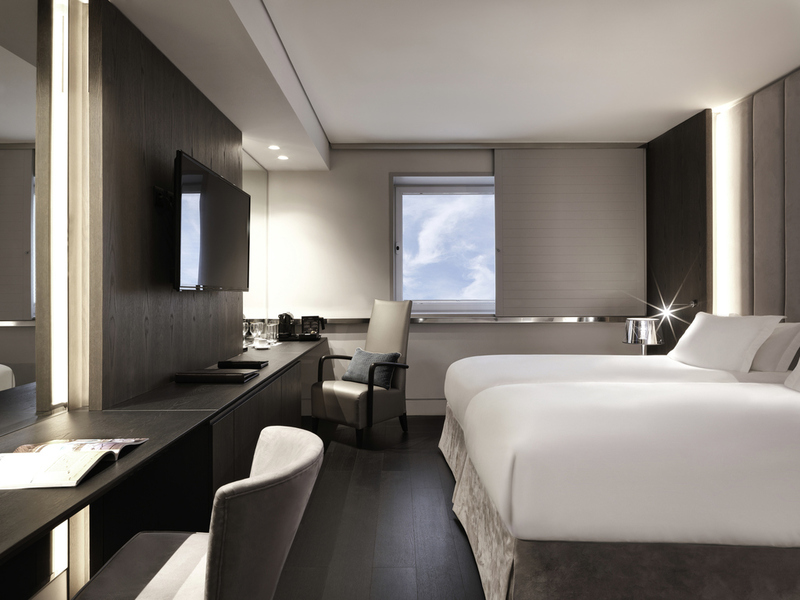 The only hotel at Athens airport, overlooking Messoghia Valley, Sofitel Athens Airport is 33km from central Athens and 2km from Metropolitan Expo. Enjoy direct access to the Olympic Stadium and Trade Center. You're 10 minutes from the nearest beach. 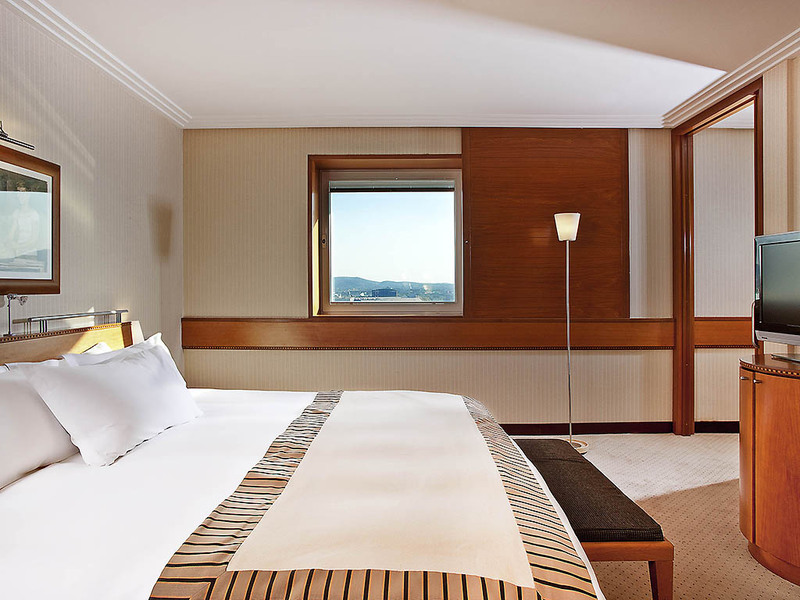 Sofitel Athens Airport is just 50 meters from the arrivals and departures terminals of Athens International Airport. Take the metro to Constitution Square, catch a train to other destinations in Greece, or drive easily onto the main highway, Attiki Odos. 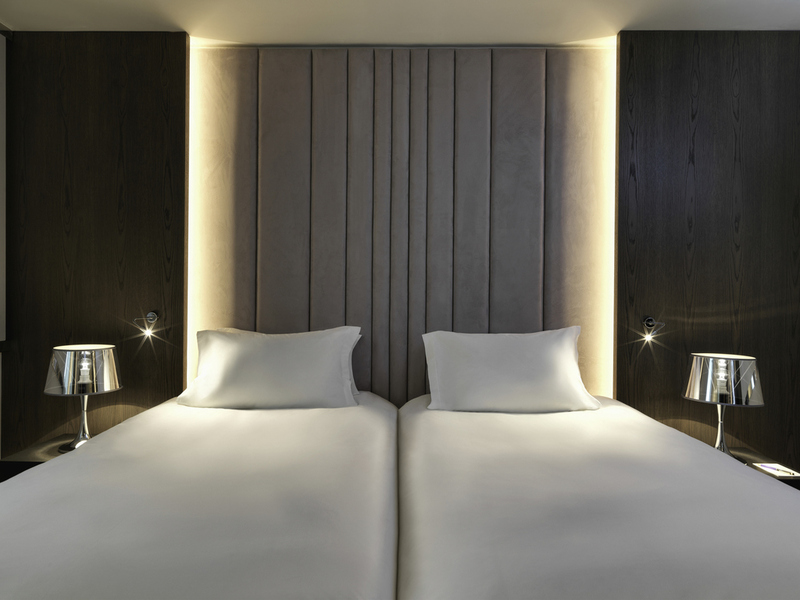 Find luxury at Athens airport in 13 hotel suites with living areas, contemporary decor with wood, and access to the executive lounge. Bathe in marble bathrooms with designer amenities. The Prestige Suite has a private whirlpool bath. The rich Mediterranean and French culinary culture have inspired our Chef who is looking forward to awakening your senses with his delicious specialties that are accompanied by selected Greek and international wines. Savor international flavors at Athens airport's best restaurants. Dine day or night on local dishes at the modern Mesoghaia, also serving buffet breakfast from 5am to 10:30am. Karavi serves fine global cuisine with panoramic views. Relax before a flight or after a day in Athens at two vibrant lounge bars at Athens airport. Meet colleagues or friends at Artemis Bar & Pergola for cocktails and small bites. Sip an aperitif overlooking the glittering runway at elegant Karavi Bar. At the elegant Karavi restaurant, admire the chefs' mastery as they craft innovative global gastronomy. Sip a drink or nibble a snack in the relaxed lounge ambience of contemporary Artemis Bar & Pergola. The modern restaurant with Greek cuisine is open day and night. TV screens show latest flight information. At the trendy pergola you can enjoy a lounge design environment, while having a drink or a snack in an enjoyable open space. 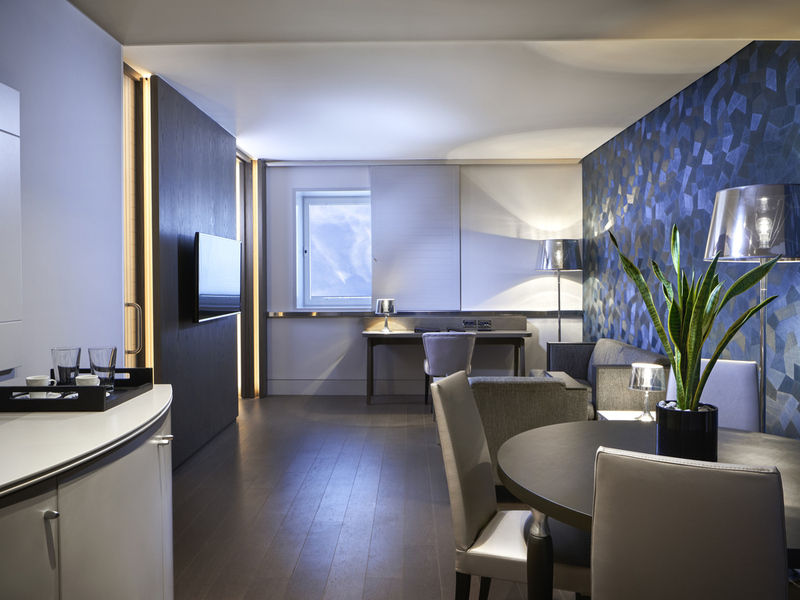 The contemporary bar is ideal for an informal meeting, morning coffee, or signature cocktail. Stop by the elegant bar at Karavi restaurant for a quiet apéritif or nightcap. Set apart from the dining room, its sophisticated décor, runway views and gentle lights are complemented by fine wines, cocktails, and international spirits. Conveniently located at Athens International Airport just 35 minutes from the center of Athens this 5-star hotel's meeting and conference facilities consist of 10 rooms hosting seminars, weddings, galas and conferences for up to 600 guests. Arrange any event from an executive board meeting and business luncheon to a magnifique banquet in the Callisto Ballroom with the help of an inspired meeting concierge. Our chef offers themed coffee breaks and creative menus suited to every event. Cutting-edge audiovisual equipment is available along with WIFI, a business center video conferencing and remote control of lights, shades, and media. An ideal business hotel at Athens airport easily accessible by metro, rail, and road. Plan your dream Mediterranean wedding in a 5-star hotel near Athens. The grand Callisto Ballroom, with its sparkling canopy of Swarovski crystals, seats up to 600 people for a Magnifique reception or 400 people for a wedding banquet. Located in the heart of the airport just a few steps from the main terminal of Athens International Airport, the hotel provides easy access with the main freeway, Attiki Odos. Underground parking facilities at your disposal upon availability. A cozy sun-lit fitness and relaxation area on the 9th floor invites you to relax in the pool and sauna or work out on Technogym equipment with stunning views. Freshen up after a flight with hair styling a massage and Cinq Mondes face and body treatments. 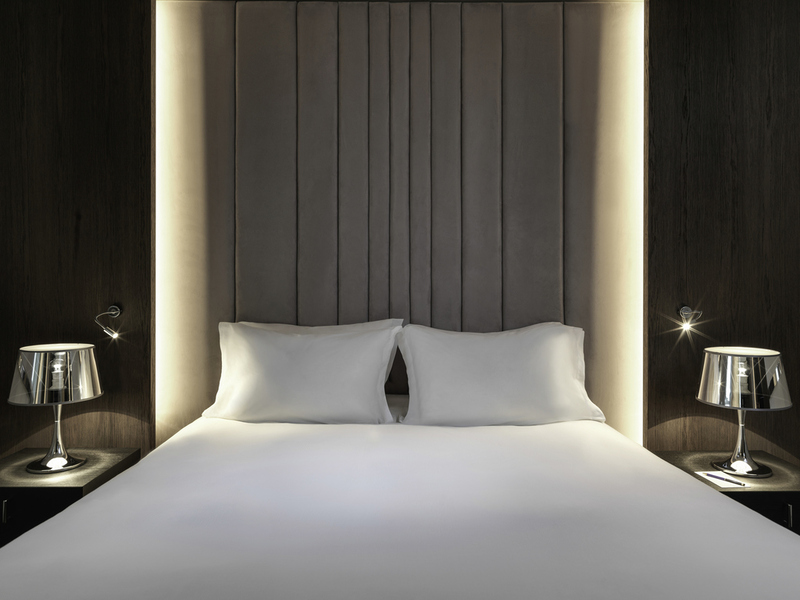 Expect impeccable service at this luxury hotel at Athens airport, where amenities include WIFI, laptop hire, an airline desk, currency exchange and Golden Key concierge who may help with transport or custom tours of Athens. Private parking available. You're just 50 meters from Athens airport and an easy taxi or train ride from the city center. Let us arrange a guided tour of Athens' museums and ancient monuments, or private transportation to Piraeus if you wish to visit the Greek Islands. Be swept into the cosmopolitan yet timeless city in the prestigious style and comfort of a limousine, and relax as you admire the world-famous Parthenon and Acropolis from an atmosphere of refined elegance. Bathed in sunlight with a spectacular view over the airport's runways, the serene indoor swimming pool floats between heaven and earth in a sublimely stunning setting.